I have been taking a nostalgic approach to this challenge and have been sharing pictures that reflect my development over the years… from my early self taught days through to my Honours Year at Uni. This journey, I think, shows the development of my work over the years, but also illustrates the basis of my major influence – the natural environment. 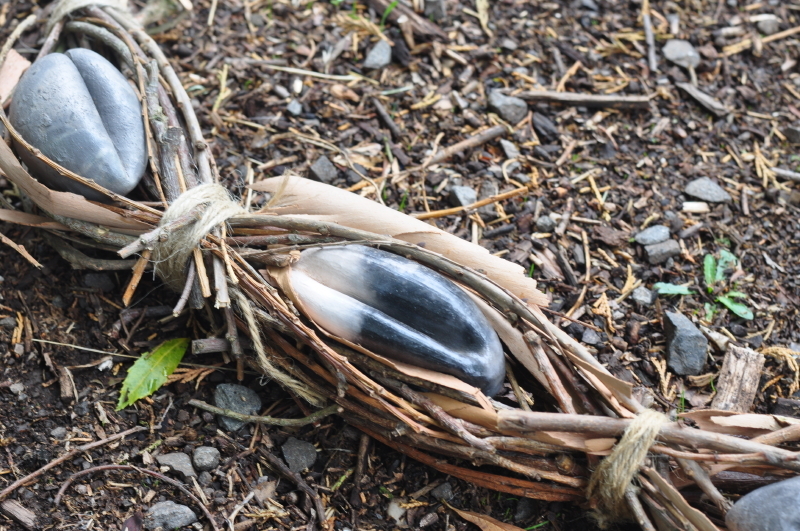 These posts show a movement from functional ceramic wares through to abstract sculptural ceramics while still capturing nature and all she has to offer, and in later work, what is in danger of being lost. Today’s images feature my PhD works– 2005-9. The title of my PhD was Sacred Space in Contemporary Society: the Artist as Sharman, and can be downloaded and read HERE. This thesis was a natural progression from my Honours thesis which questioned the role of ceramics in the 21st Century. 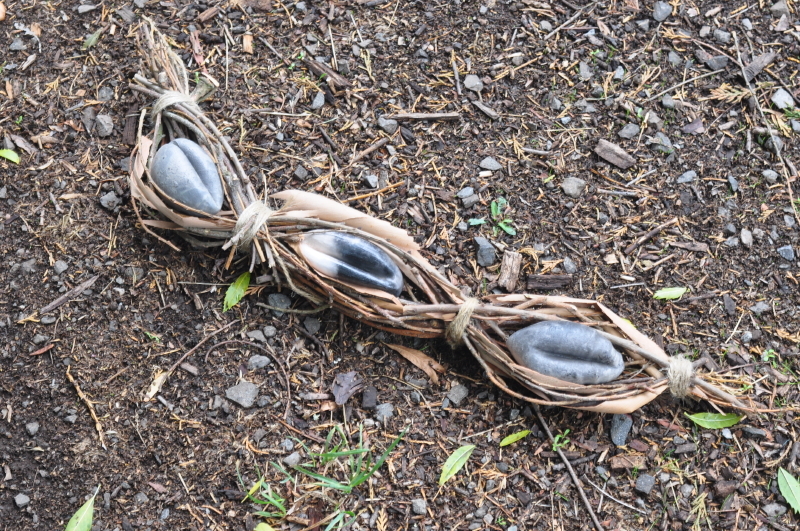 My PhD thesis asserted that sculptural ceramics installed in the natural environment – an installation – could act as a conduit reconnecting humanity to the Earth – an act that is required if we are to stop using & exploiting the environment. The research was framed within a feminist framework, exploring the patriarchy that has allowed the unstemmed growth of capitalism and exploitation. In this context the artwork was developed to sit within the landscape, not overpower and dominate, as does much modern patriarchal sculpture. Until my final post tomorrow…. 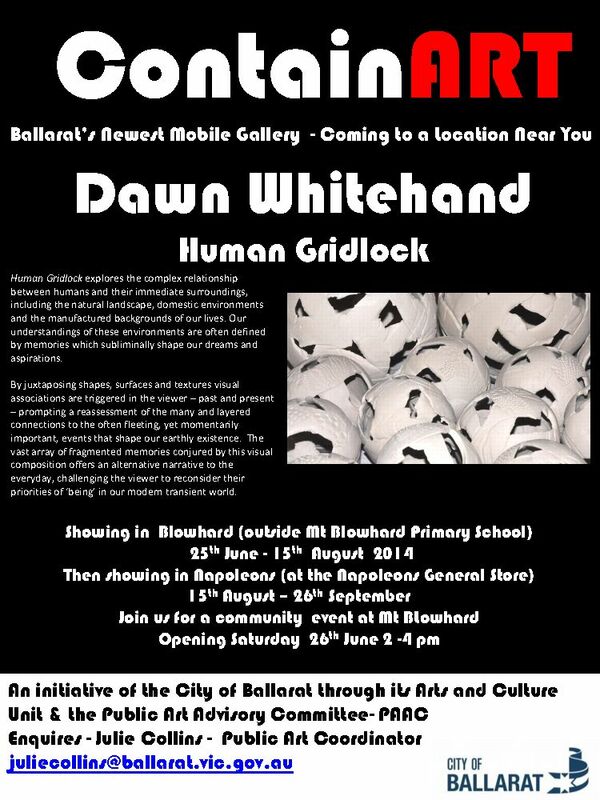 If you are in or around the Ballarat or Melbourne area this weekend be adventurous & rug up to join me for the opening of my solo exhibition – Human Gridlock – this Saturday afternoon 26th July between 2-4pm. The exhibition is being held in ContainArt, and begins in Blowhard running till Mid August when it will then travel to Napoleons. The Facebook event page also features sneak peeks of works in progress for the exhibition and other updates.